As a high school senior I visited the WSU campus in Pullman and saw a baseball game with Buck Bailey in his final year as the Cougar baseball coach. The next year when I joined the freshman class in 1961, I was part of the first group of players recruited to the incredible 33-year BOBO BRAYTON baseball era at WSU. Within one year I had just met two of the most storied and colorful coaches in the history of American baseball. At that time, budgets and facilities meant that there were no assistant coaches, and road trips were in state-owned station wagons driven by Bobo, Marv Harshman (when recruiting for basketball), and certain “responsible” players. As the team catcher I always rode with Bobo for strategy discussions as well as his “zit game” partner—a point for being the first to say “zit” when a dog, green-headed duck, or pheasant is identified, 5 points for a white horse, and 15 points for a cougar. I also had the privilege of being Bobo’s road roommate if Harshman wasn’t along. Every Cougar who played for Bobo would recall those driving adventures as a source of some of their most hilarious and memorable Bobo stories. Bobo was larger than life in every way. On the field it was his intense coaching methods, dugout humor, dramatic tirades toward umpires, and, at times, the intensity would turn toward players whose attention had strayed or whose execution was flawed. A teaching moment was at hand. His practices required concentration. Everyone was continuously involved and in motion. A college baseball player spends much more time with his baseball coach than any of his professors, so there are many opportunities to learn life lessons and acquire values. Bobo was a central figure and mentor in that growing up process for me. Some of the lessons I learned include: don’t let anyone out-work you; don’t let anyone be better prepared; be as good as you can be; make the most of where you are; have pride in your school (it’s great to be a Cougar); have pride in your country (it’s great to be an American); a swinging bat is a dangerous bat; and quality wins. Bobo was a vital life force. He gave everyone around him energy. He taught us baseball skills as well as how to focus our intensity, compete at the highest level, and most often to win. Having played seven years of professional baseball while going to medical school, I can easily say that Bobo was the best teacher of the game and the best baseball strategist I ever knew. I was happy that his career was sufficiently long that my son was able to play for him at WSU and have the opportunity to experience the same lessons in baseball and life that meant so much to me. John E. Olerud is professor emeritus of dermatology at the University of Washington’s School of Medicine. 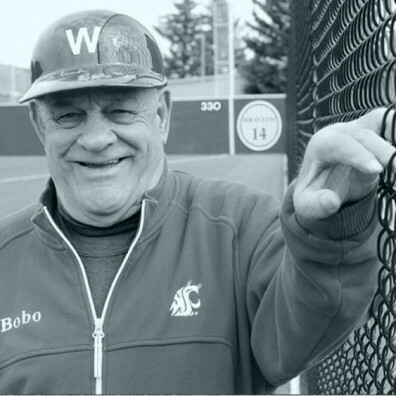 He received WSU’s highest alumni honor, the Regents’ Distinguished Alumnus Award, in 2011.Charles “Bobo” Brayton coached WSU baseball from 1962 to 1994. His Cougar teams won nearly 70 percent of their games, captured 21 conference titles, and made 10 NCAA postseason appearances and two trips to the College World Series.